Mother's Day weekend! Buy her flowers, send her a gift, take her to the theater or at least download Mother's Day songs to sing to her. Whether it's to a first-time mom or an experienced mother, Mother's Day is special to her and is also a great time for you to say "Thank you" to your dear mom. So, emotional and happy Mothers Day songs download from Boyz II Men, Backstreet Boys, Drake, etc. prepared here is the ideal way to express your sincere love to mama. Need to download Mother's Day songs music MP3 AAC FLAC etc.? 5KPlayer from DearMob brand is a proper mama song download software that helps free download emotional, thankful and happy Mother's Day songs from 300+ sites with fast speed and high quality. Mother's Day songs are not difficult to find. 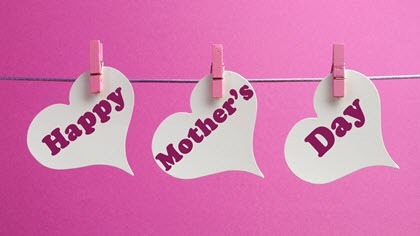 Boyz II Men, Backstreet Boys, Drake and many other artists have recorded songs especially for beloved moms, and this place just gathers top best mama songs for Mother's Day on YouTube and categorizes each Mothers Day song for easier finding. Happy Mother's Day song with simple nursery rhymes and lyrics is very easy for little kids to sing. "Mother's Day, Mother's Day, Happy Mother's Day/ Here's a gift I'll give to you on this Mothers Day/ I'll clean my room, I'll make my bed, I'll put my toys away, I'll be good just for you on this mother's day." "I Love You Mommy" Mother's Day song is made easy-to-learn and easy-to-teach. The words are simple and the melody is catching, and it also allows children to follow easily and sing along with. "I love my mommy, I love my mommy/ I love my mommy, yes I do/ here's a kiss and hug for you/ Thank you mommy for all you do/ Happy Mother's Day, Happy Mother's Day/ Happy Mother's Day, I love you." "Hugs and kisses, hugs and kisses, just for you, just for you!/ Just tell you, Mommy/ Just tell you Mommy, I love you, I love you!" Just give your mom a hug and kiss and she will smile a whole day. If you just happen not to be around, call her and sing her 'Hugs and Kisses for Mommy'. If these kinds of Happy Mother's Day songs are what you are looking for, you can just stop here and use 5KPlayer to free download mama songs to celebrate Mother's Day right now. 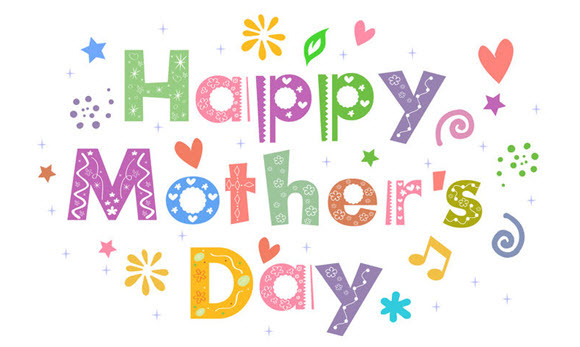 Compatible with 300+ online video sites, this Mothers day song download tool can help you download Mother's Days songs one by one or in playlist fast from YouTube, SoundCloud, Dailymotion, etc. with no quality loss. 'Dear Mama' from American hip pop recording artist 2Pac is a tribute to his mother. In this mama's song, 2Pac details his childhood poverty and his mother's addiction to crack cocaine, but argues that his love and deep respect for his mother supersede bad memories. "When I was young me and my mama had beef/ Seventeen years old kicked out on the streets/ Though back at the time, I never thought I'd see her face/ Ain't a woman alive that could take my mama's place/ Suspended from school, and scared to go home, I was a fool/ With the big boys, breaking all the rules/ I shed tears with my baby sister/ Over the years we was poorer than the other little kids…"
The song writer of "Umbrella" for Rihanna, "Single Ladies" for Beyoncé and "Baby" for Justin Bieber, The-Dream would never disappoint you to offer a great Mother's Day melody. "Mama" song is just what he want to say to her mother. "I'll let you know, I wanna let you know, mother, oh/ I wanna let you know how I've been thinkin' 'bout you/ How I've been thinkin' of you/ Always thinkin' of you/ I wanna let you know I've been thinkin' of you/ Always thinkin' of you/ I'm always thinkin' of you…"
Express your direct love to your mother by saying this love song for mama. "Mama, Mama you know I love you/ (You know I love you, you know I love you)/ Mama, Mama you're the queen of my heart, (You are)/ Your love is like tears from the stars/ (Your love is like tears from the stars)/ Mama I just want you to know (Mama I just want you to know)/ Lovin' you is like food to my soul". How to Free Download Mother's Day Songs via 5KPlayer? Step 1: Free download mama song download software 5KPlayer, install and launch it on your computer. Step 2: Open your browser like IE, Firefox, Chrome and put the name of the Mother's Day songs into the search box to search the mama songs you prefer, then open what you have searched and copy the song URL. Step 3: Click the "YouTube" tab on the main interface of 5KPlayer and click "Paste URL & Analyze" to input the song URL you just found or the URL listed on this page. 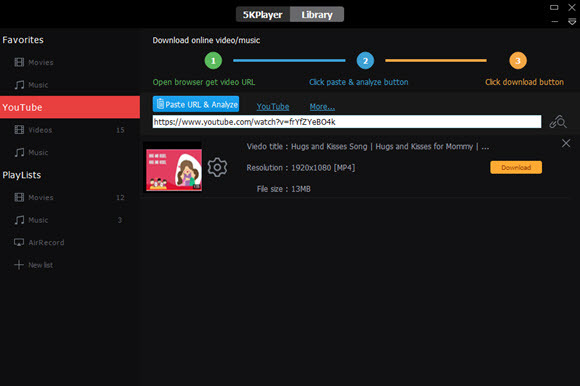 Step 4: After analyzing, just click Download button to free download Mother's Day songs with 5KPlayer. Check the top 20 graduation songs including best college graduation songs mp3 mp4 or best graduation music for high school. Check the top new workout music playlist of 2016-2018 and download workout songs in MP3 for iPhone/iPod.